Baguio Country Club it has a cool pine cone smell, like no other. Baguio Country Club have you been yet? Baguio Country Club is either for sophisticated holidaymakers or the usual travel-parched homely bodies looking for a premiere tourist destination in the Philippines and it will not disappoint you. Baguio City is situated 250 kms north of Manila, nestled in the cool upper parts of the main island Luzon, amidst the Benguet mountain peaks. 5,000 feet above sea level, this charming “City of Pines” is both locals’ and tourists’ favourite vacation spot all year round. Hands down, there is just nothing like it anywhere in the Philippines, whether it is a place to settle down and work for a living, or just to be part of the community and (literally) cool down, unwind and be one with nature. Baguio is a unique experience all on its own. Make a mental note, if you go to Baguio City you must go to Camp John Hay, mind you the city is quite small and I doubt you would miss it, it is worth a look even if you do not stay there. But if you really want to have the real deal of this charming 690-hectare property of lush greenery, then Baguio Country Club is the way to go. Baguio Country Club a Concentration Camp? Speaking about how the Club came to be is to also talk about Camp John Hay’s history. A former American military recreation zone after the Spanish colonial era it then became a Japanese concentration camp for American and British soldiers during the World War 2. In 1991 it was turned over to the Philippine Government. At one stage it was off-limits to Filipinos, but it's now is a thriving tourist residential-commercial area open to the public. It also boasts Baguio City’s largest pine tree conservation area, faint traces of pine, not smelled in the city proper anymore, waft abundantly here. With it being set in a convenient location near Baguio City’s prime tourist destinations and commercial districts, it is one of the oldest clubs in the Philippines. Further developed into a world-class hotel-resort, it offers exclusive membership, guests must be accompanied/sponsored by a Club Member. The Baguio Country Club is very popular among golf enthusiasts. It has a well maintained 5,330-yard, 18-hole, par-68 golf course, with motorized golf carts making the daunting fairway hills easy to navigate. A caddy fee for 9 holes is 200Php and 300Php for 18 holes and remember to never disregard your caddies advice, it could save you same golf balls. The rolling hills, looming pine trees, with pretty garden-patched cottages surrounding its tight fairways, make accuracy critical in the restrictive layout. No matter how well you play it is still a very satisfying golf course, one of the oldest and finest in the country. Enhanced with modern amenities, it has also long been a favourite for both business and leisure travelers; its guestrooms have all the comforts you would expect in a hotel of its class and coupled with Filipinos’ signature warm hospitality, its guests are sure to feel exactly at home. 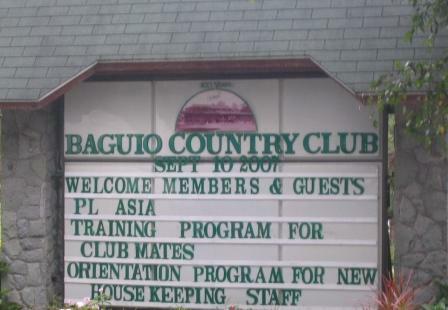 The Baguio Country Club also has a highly sought-after corporate and formal social function venue, where conventions and other business-related conferences are held. If you are looking to enjoy the Baguio Country Club, you should expect a rather high occupancy level on the weekends, most especially before and after Holy Week, a Philippine holiday during the first week of April, annually observed by the country’s major Catholic population, so make sure you book to avoid disappointment. Baguio Country Club still truly remains one of the best in the country. Click here to compare prices and read what other travelers have to say about the Baguio Country Club. 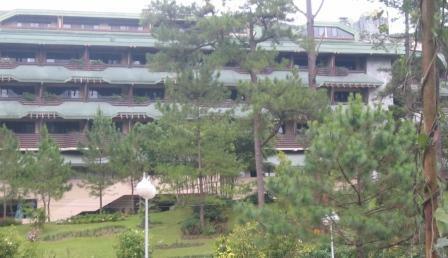 If you want to see other hotels in Baguio have a look here.